Growing up I never liked any 'typical" picnic/bbq food. Potato salad always tasted too sweet or full of mayonaise and I was more likely to eat dessert than hamburgers or hotdogs. 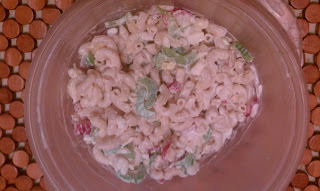 As I grew older I tried a larger variety of foods and fell in love with macaroni salad. Not the store bought type, good old homemade macaroni salad with pickles and eggs. However, as I got older and the metabolism of my teenage years began to wear off after two kids I started looking for healthier alternatives to my favorite recipes. Recently, Everyday Food magazine had a recipe for Creamy Macaroni Salad utlitlizng yogurt to reduce the fat, making a healthier version of a household favorite. This recipe goes together very quickly. There are 11 ingredients, including salt and pepper and the total cooking time is approximately 25 minutes. The majority of the prep is from the cooking of the pasta and the hard boiled eggs, which can both easily be made prior to the recipe and refridgerated. I followed the recipe as stated, except I used full-fat plain yogurt, instead of low-fat as suggested by the recipe. Other people might have better luck finding low-fat plain yogurt, but my local grocery stores only stock whole-fat plain yogurt in the big containers. Additionally, I utilized my homemade dill pickles for the chopped dill pickles, which tasted delicious. The one modification I suggest for the recipe is to allow the macaroni salad to sit in the fridge until completely chilled before serving. I served the dish only partially cold and I think it would have been even better chilled. That being said, my husband and I enjoyed this dish. 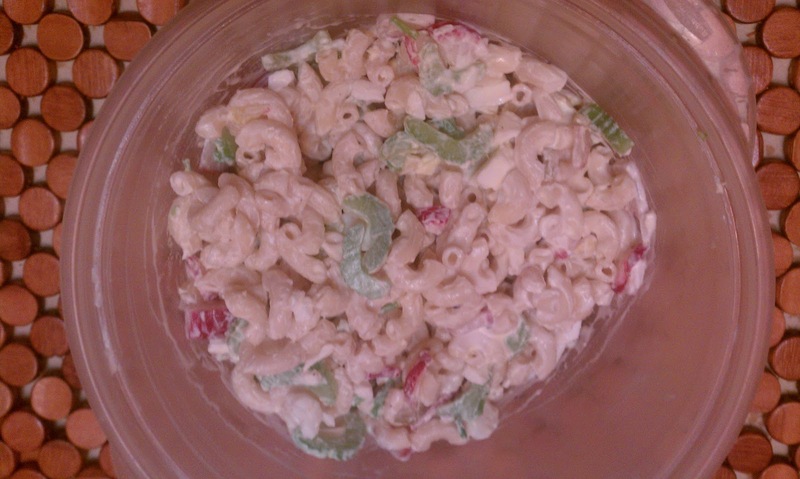 It doesn't taste exactly like a traditional homemade macaroni salad, but it is much lower in fat, using low-fat yogurt this recipe has 210 calories and 5g of fat. The traditional recipe contains 317 calories and 11g of fat, so a large difference in fat and calorie content between the two. A great recipe to cut down on the fat of traditional summertime salad recipes. This recipe is currently unavailable, but can be found on page 104 of the July/August issue of Everyday Food magazine. I would love to try that! I have not found many mac or potato salads that I like. However, my step mother makes a mean german potato salad! Come to think of it, I need to get her recipe! Hello and thanks for the lovely message on my blog. I'm following you also. Your recipies are great, i'm always looking for new ideas. Can't wait to try some of these recipes. They look awesome! Stopping by from Bloggy Moms. Just started following you. @momof2 I love German potato salad, my mom used to make it growing up, it's great! This looks so yummy! I found you on the blog hop and just wanted to let you know that I am your newest follower! I would love to have you stop by and visit our blog! We also host a link party every Saturday and would love to have you link up any of your posts! If my GFC doesn't show up, try reloading your page. It's being weird for some reason. @Inspired I have been trying to use more yogurt in my cooking also, it's a great way to reduce the fat!